Poor Freddie Minnis might have already peaked at 11 months old. 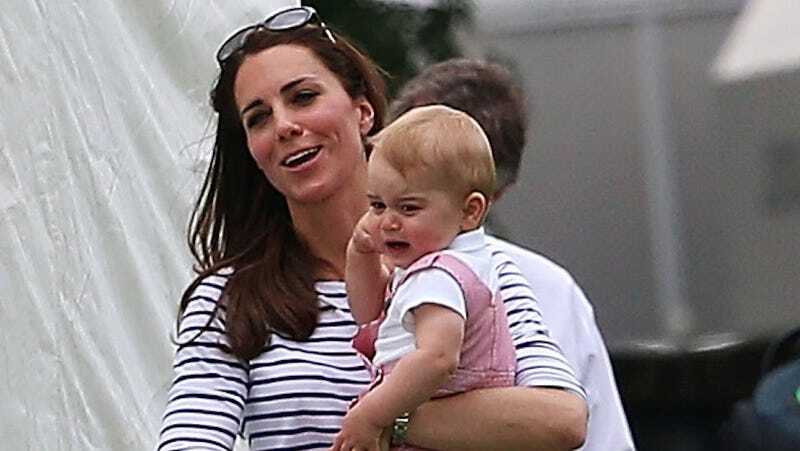 He's just won a contest to be a Prince George lookalike. According to the Daily Mail, a "personalized baby gift retailer" hand-selected little Freddie (whose adorable mug you can view here) for the job. He's already modeled their Crown Collection. Meet the Prince George lookalike - but is YOUR child more convincing? Carly and her husband Ross got engaged the same year as William and Kate, tied the knot five months after the couple and Freddie was born just four days before Prince George. Carly said: 'I've always been a fan of the Royals and the similarities between my family and the Cambridge's is strange. 'I never noticed Freddie's resemblance to Prince George until I saw all the TV coverage during their recent visit to Australia and New Zealand. George was dressed in clothes similar to those Freddie wears and they seem to have the same temperament. 'Like George, Freddie moves around by himself although he's skipped the crawling and has gone straight to trying to walk, and just like the Prince, if he isn't doing what he wants, has a very cute pouty, sulky face. 'He's also obsessed by our family dog Minnie, just like George appears to be with Lupo. Seems like it's meant to be. Yet I'm gonna be the party pooper here, and say that Freddie is missing George's telltale chubby cheeks. And while both babies are cute, sure, they also just sort of look like ordinary babies doing ordinary baby things. I'm sure a ton of babies—no matter their race, gender, whatever—love dogs and skipped from crawling to walking. But hey, if there's a company involved who wants to make money off of some moppet's vague resemblance to royalty, who are we to judge?